Powders are some of the trickiest additives to handle; here, Yargus’ LAYCOTE powder handling system which uses air pulsation and vibration to treat dry blends. Many current customers have plans in place and projects in their queue — that’s the good news for many in the blender business, says Bruce Hinkeldey with Ranco Fertiservice. “But there does seem to be some more caution based on the last few years of relatively tougher experiences for growers,” he says. One of the reasons equipment is needed is simply the age of the technologies. Retailers are assessing what changes they need to make to meet current mixing demands. “We see interest in bringing existing systems and facilities up to higher capacities and capabilities,” Hinkeldey says and comments that this is an area where he thinks his firm can excel because of the flexibility of the Ranco DW blend system. Today’s mixing demands call not only for even higher volumes but more accuracy. Charles Formisani, Director, Business Development with Sackett-Waconia, feels that output is still high on the list of customer requirements for systems, but “we see a trend towards blend quality being as important as speed. Not all growers will pay extra for better blend quality or value-added products but this mind set is quickly changing,” he says. Value-added products can include urease inhibitors, micronutrients and specialty liquid and powder ingredients. Adding these components to the mix can be a challenge, but engineers continue to address these needs as well. For instance, Yargus’ LAYCOTE line of equipment has been designed to accurately meter out liquid and powder products during the blending process, says Jeff Ivan, International Sales. “Our LAYCOTE Powder feeding system, in particular, has evolved to allow for small scale batch powder automated additions to existing systems, as well as to large bulk handling systems such as the 12 bulk hopper system designed for Wedgworth Inc. — which is utilizing the WolfTrax DDP micronutrient product line,” he says. Another challenge for fertilizer plants has been keeping facilities up to the Occupational Safety and Health Administration (OSHA) requirements, especially in the current climate of consolidation. For instance, smaller independent retailers, some in more remote locations and using older equipment, have not been inspected by OSHA teams, but are now getting increased attention as their operations are picked up by national chains. 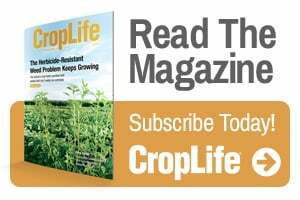 “Some of those old towers that haven’t changed are not in compliance,” points out InterSystems’ Nate Reznechek, Crop Nutrient Equipment Sales Manager. If OSHA discovers the same violation at multiple acquired facilities, the problems can be classified as a “willful violation,” resulting in excessive fines. He says features such as proper guardings and clearance and ease of maintenance are some reasons why some customers like InterSystems’ towers. Yargus continues to see demand for its new LAYCO 6 Leg Tower, which features the company’s Stairway to Heaven addition to improve OSHA compliance and ease of access for employees. The LAYCO Tower systems are available with the Dual Layco Tapered Vertical blending systems or the LAYCO Performance Mixer. Retailers can look for a number of other improvements in blender systems this year. 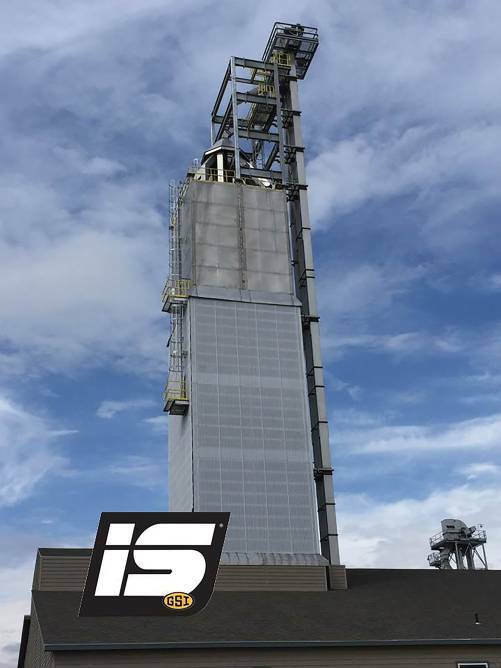 Reznechek says InterSystems has updated the classic single weigh hopper blend tower design to meet industry challenges. Changes include larger and dual stage valves for faster and more accurate product weighs, heavier gauge materials and structural members to handle the corrosiveness of the environment for extended life, and a streamlined design to remove cross bracing and minimize erection duration and hardware. Additionally, the company’s double weigh hopper solution utilizes an 8-ton horizontal twin shafts stainless steel mixer along with larger gates and larger spouting to again accelerate blending time and weigh accuracy, Reznechek explains. “For those who wholesale more product than they retail, we have a triple weigh hopper system that is essentially a retail and wholesale tower combined into one stand-alone hybrid-tower, a first in the industry,” he says. To meet the demands for quicker, larger outputs, R&R Manufacturing debuted its 16-Ton Low Pro Minuteman last year. 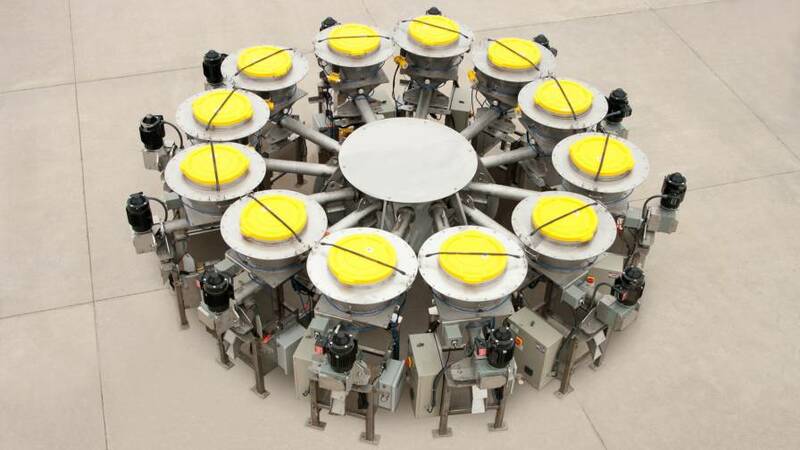 The unit measures 10 feet in diameter to reduce height, has heavy duty gear reducers direct coupled to TEFC electric motors, and has larger augers than the company’s standard units for improved in-feed and Mix times. “The unit still has low horsepower requirements even with the new bigger and faster features,” points out Justin Goertz, Inside Sales Manager with R&R. Ranco has found that customers are needing to break apart lumpy material before it is blended — so the company is now offering product conditioners in its 10- and 12-foot wide DW bins. “This allows the retailer to condition the material as needed just before it is mixed with the other products,” says Hinkeldey. In addition to equipment advances, the past year has seen some re-alignment among players in the blending industry. A.J. Sackett & Sons and Waconia Manufacturing had been linked as partners and leaders in providing engineering and equipment to the fertilizer industry since 1995. Last month, the two companies, under the same ownership, consolidated further by aligning their sales force and product lines, to form a new organization called Sackett-Waconia. Combining the companies will streamline engineering, product design, and customer service and support efficient equipment fabrication, says Formisani. Last fall, Yargus Manufacturing entered into an agreement to sell its manufacturing operation to Ag Growth International, Inc. (AGI), a publicly traded company located in Winnipeg, MB, CAN. New for wholesalers, this first-of-its-kind hybrid blend tower from InterSystems/AGCO has a triple weigh hopper. FEI, based in Valley City, ND, and Davis Equipment in Johnston, IA, are both now offering the GSI/InterSystems line of material handling, weighing, blending and product conditioning equipment. “They have been dealers of our Willmar tender and spreader line for decades, and so we’re very excited to have their seal of approval on our blending and material handling equipment as well,” says Reznechek. This partnership ensures local support and service to the majority of the region. CropLife® magazine asked manufacturers how they thought the new administration might impact their market. A few took us up on the question. “There is some sense that ag retailers are waiting on buying decisions to see how the upcoming political changes affect each of them and ag as a whole,” says Ranco’s Hinkeldey. His company is looking forward to a more “business friendly” environment. Yargus’ Ivan agrees and believes that the administration will lower corporate taxes and implement programs to create jobs. It will support U.S. companies who produce in the U.S. market. “There is a high probability that we will see the inflation rate increase and the jobless rate decrease in the market, and the U.S. dollar could weaken in this scenario,” he adds. Basically adding supplements to soil, normal or natural composts likewise enhance the quality and structure of the dirt, which over the long haul offers extra focal points like enhanced water maintenance and seepage.The objective is met in two ways, the conventional one being added substances that give supplements.